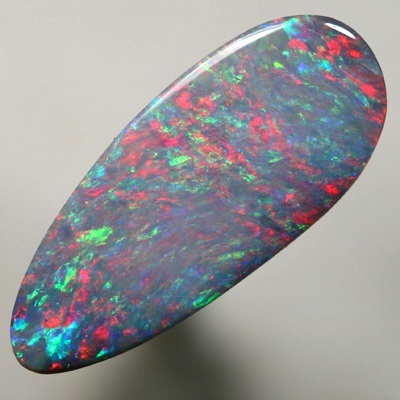 This opal is very lively, flaming with bright and rich colours, across the complete face. Cherry red is the main colour in this opal, surrounded by golden orange and gold yellow and bright green over a background of blue purple. All are vibrant and swap and change with the slightest movement. The red colours cover the majority of the face, stealing this magnificent show.